I highly recommend David Engesath and his potter ministry. My church was truly edified by his teaching on the "Judgment Seat of Christ". It is amazing to see Jeremiah chapter 18 come to life on the potters wheel! Pastor Keegan Hall, Indian Gap Baptist Church. Indian Gap, Texas. We had Brother Engesath & his wife Diana to our church in Maine this summer for one reason. I cannot think of a more important subject to preach on in these last days than the doctrine dealing with the Judgment Seat of Christ. This message is timely & spot on. Brother Engesath brings a message that will challenge the Church to be busy about the Lord's business & having the right motive. 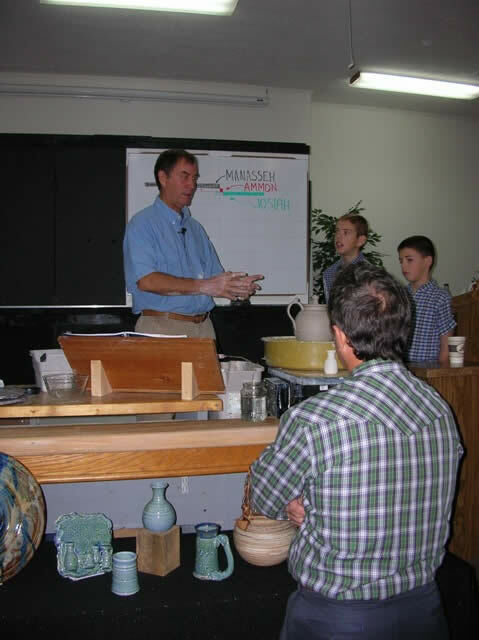 Brother Engesath brings this message in a unique presentation using his God given talent as a master potter to help us to understand how it is that God fashions & molds his creation unto good works for his pleasure. Good works that will abide the fire. This is the kind of ministry I would expect my Lord to raise up in these "last days" before he catches his bride away! Pastor Mike Kee, For His Glory Bible Baptist Church. Union, Maine. Recently we had Bro. David Engesath here at our girls home for a youth day. He taught and preached on the Judgment Seat of Christ while making pottery. I was truly blessed and challenged by it all. Since then I have received nothing but wonderful testimonies of how God used it to speak to hearts that day. I would highly recommend Bro. Engesath and his ministry. Both he and his wife have servants hearts and sweet spirits. Prayerfully consider having Bro. David in your church, youth meeting, VBS, etc. I am sure it will be a blessing. Richard Azud, Marvelous Grace Girls Academy. Pace, Florida. Thanks for suggesting Bro. Engesath, he did a great job, I'm going to try to get him in again. Pastor Andy Grant, Bible Baptist Church. Madison, Alabama. He really helped our guys here at the mission. Ken Turner, Faith Rescue Mission. Montgomery, Alabama.